The Bruntsfield Links Golfing Society dates as far back as 1761 (when golf was played over the six-hole Bruntsfield Links, near Edinburgh Castle) therefore it is the 4th oldest club in the world. Despite the club name of Bruntsfield Links Golfing Society, the club’s course is not a links but a parkland layout in the suburbs of Edinburgh. Play on the original course was shared with the Edinburgh Burgess Golfers (now the Royal Burgess Golfing Society) and was restricted to two months in the spring and three months in the autumn with the land being used for pasture in the summer months. During the Society’s time at Bruntsfield, one of the many prizes on offer was the Cairns Medal of 1839, which was intended for competition at Musselburgh. Play at Musselburgh was nothing new and the members had been going there for years because the Links were open all year round. In 1886, the club built a clubhouse in Musselburgh so that four historic clubs existed cheek by jowl in the same street beside the public links of the Old course – the other clubs being the Honourable Company of Edinburgh Golfers, Royal Musselburgh and The Edinburgh Burgess Golfers. Not surprisingly, with four clubs sharing a 9-hole golf course, there was a problem with congestion, which eventually necessitated the move to an alternative venue for all of them. In 1898 the Bruntsfield Captain informed members that the club were looking for land to build their own course. Negotiations were entered into with the Maitland family for land at Barnton Gate to the west of the city and Willie Park Jnr (a Musselburgh man and twice Open Champion) was commissioned to lay out a course. 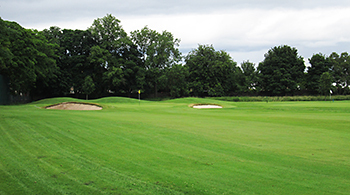 The course shares a common boundary with next-door neighbours the Royal Burgess Golfing Society, but Bruntsfield is more undulating and more heavily tree-lined than the Burgess course. This is prime parkland golfing terrain and both courses are renowned for their excellent conditioning. The Bruntsfield site is one of the most attractive settings for any golf course in a major city and it commands spectacular views across the Firth of Forth to Fife. Dr Alistair MacKenzie was instructed to carry out course modifications in 1922 and Fred W. Hawtree, the internationally renowned golf course architect, carried out a major reconstruction in 1971. The Bruntsfield clubhouse is one of great antiquity with a cherished history but it is also one of the great clubhouses in which to relax and dine after a round on the course and its lunches are as famed as those at Prestwick and Muirfield. In January 2017, the club announced that architects Mackenzie & Ebert would oversee a significant course redesign which would result in the layout reverting to a par 71 by extending the current par four 13th hole to a par five and introducing a new signature par three 16th hole to replace the existing par three 12th. I played in Bruntsfield Links the day of arrival on my trip to Scotland, before heading to Aberdeenshire, and as a kind of warm-up before facing the northeast links. The impression of the club is to be one of the most charismatic of Edinburgh, with a long tradition behind, and its location allows you to enjoy a privileged environment at a short distance from the centre of the city. As for the course, it is really entertaining and has some very interesting holes, highlighting the use and location of the bunkers. To mention some holes, I would opt for the 5th, a beauty of short hole playing downhill, the 6th, with its devilish green, the 10th and 11th, two tricky par 4s that dogleg left, and the 16th, a very nice par 3 recently added. I must emphasize the conditions in which we played: the fairways and greens were so hard as I have never found in an inland course, which took us some holes to get used, and forced to consider the strategy in each hole and to accept, sometimes, unexpected breaks and bounces. Great fun in all, anyway. In short, a solid course and fun to play, worth playing if you´re staying in Edinburgh. Situated close to the city centre in a leafy and exclusive part of Edinburgh lies one of Scotland's oldest and most celebrated parkland courses. For much of its long history this most private of member's clubs has undoubtedly shied away from attracting visitors but, thankfully, attitudes have changed in recent years with the club adopting a more welcoming stance to the travelling golfer. The spirit of modernisation has even extended to a programme of course alterations and bunker renovation drawn up by leading golf course architect Tom Mackenzie , something not seen at Bruntsfield for over 40 years. Ground work is being carried out by the experienced Sussex based 1st Golf Construction who were responsible for two excellent new holes on the Dunluce course at Royal Portrush in readiness for the Open Championship. A handful of bunkers had already been dug out at the time of my recent visit and three new greens were beginning to take shape. Some of the most noticeable changes include extending the current 13th into a par-5 which removes the current short 12th in its entirety, a new green and tees on the 11th, a completely re-routed 17th with a new, much lower, green complex and the introduction of a great looking new 16th hole. Played over water, this is likely become the best par-3 on the course. It’s a while since I played at Bruntsfield so I was glad to accept the offer of another game here the other day. The club appears to be more outgoing these days, even promoting discounted twilight golf for visitors in the late afternoon, which is good for more cost conscious golfers who might be looking for a casual round on a superior parkland layout. The fact that the course has risen five places in the newly updated Lothians rankings is as good an indicator as any that the course is more appreciated than ever by those who can spot a top track when they see one and there’s no denying the somewhat understated quality of a course that’s been shaped by architecturally renowned figures such Willie Park Jnr, Alister MacKenzie, James Braid and Fred Hawtree, with fairways delightfully routed around an expansive property. It appears that many prefer the holes on the back nine, where fairways are laid out around an old disused quarry, largely because golfers can catch occasional views across the Firth of Forth. For me, the front nine is the better of the two halves, with the slightly uphill, short par four 6th easily the feature hole, doglegging right to a heavily contoured, sand-protected green. If well-manicured parkland is your golfing venue of choice then Bruntsfield Links should be high on your playlist. Course was in great condition. Well manicured and a joy to play. Staff in the clubhouse were very hospitable and friendly. Greens were very good and the course was a tricky but fair test. We will be back. I visited Bruntsfield Links for the first time last week. Having grown up in Edinburgh I knew this was an historic private club but didn’t know much about the course or what to expect. After checking in with the pro we were encouraged to use the practice facilities and were offered free range balls which was nice. We were also invited to enjoy complimentary tea & coffee in the visitors lounge and one of the members kindly provided some info on the club which claims to be the 4th oldest in the world. The course started with a challenging Par 4 playing into the breeze but I managed to get on in 2 with a good drive a solid mid-iron. My favourite holes were the Par 4 6th hole which is a severe dog leg left to right and only requires a fairway wood and short iron to an elevated green. Also the finishing hole, the members supposedly joke this is the longest 340 yard par 4 in the lothians. Not a difficult tee shot but a long narrow green which I managed to 3 putt as there are lots of slopes. Greens were a good surface and the course offers lots of space and winds itself around an old quarry in the middle. We enjoyed a pint outside on the patio afterwards and took in the views over the Forth to Fife. I’d strongly recommend this course and note they are doing a twilight rate for £50 which offers better value in the summer. I’d say Bruntsfield is definitely in the top 5 courses I’ve played in Edinburgh. I play Bruntsfield several times each year thanks to a friend who is a member so I know it pretty well. It is always in good condition and usually pretty quiet. The greens tend to roll well. I believe it is at best an average course and was astonished it was used forfinal regional qualifying for the 2011 Open Championship. There are very few 'wow' moments to be had at Bruntsfield. The opening stretch is long and rather dull with the exception of the nice downhill 2nd. The 5th is a one of three nondescript par 3 holes on the course - only the 7th has any charm. While the 8th is another enjoyable downhill par 4 it is followed by one of several similar holes back up the way. I would contend that the slight dogleg 10th is the most interesting hole on the course and it also affords lovely views towards Fife.11 is a challenging driving hole but the inward half is mainly flat. !7 is another hole played up to an elevated green before the rather strange 18. As a city course for Edinburgh professionals Bruntsfield is ideal but I am sure many members are pleased to get down the coast at weekends! The Golfing Society may have spent just over the last one hundred years at Barnton but what a glorious site on which to celebrate its forthcoming 250 years in existence. This lush parkland track is laid out within an enormous estate amidst the leafy suburbs to the west of Edinburgh city centre but once out on the course, hundreds of mature trees shield the layout and its golfers from the outside world - save for the occasional glimpse over the tree tops to the River Forth and Fife in the distance. It was more undulating than I anticipated, epitomised by a lovely run from holes 4 to 6 where par 5, 3 and 4 holes were played in succession, up-down then uphill again. Fairways were very wide and forgiving and putting surfaces were large enough to hold even some slightly wayward approach shots – the 8th green was out of commission as part of an upgrading program, a tangible indication that the club is not resting on its golfing laurels in relation to course development. The 10th hole was another favourite with its narrow entrance to the green and the dog legged 14th was a very tough par five hole, with anything too far to the right being blocked out by trees to the front right of the putting surface. All in all, a very pleasant course that is complemented by a magnificent clubhouse where lunch really was as good as anticipated! Don’t miss out too on the unique display cabinets of antique trophies, medals, clubs and memorabilia. The familiar warm Scottish welcome awaits here and the clubhouse facilities are remembered for all of the right reasons – special place. Warmed up well on the range and then went to the course with great anticipation. Although the parkland style of course is not my favourite, I warmed to the course easily. Very manicured course with high standard greens and some cracking views across the Forth. Best holes for me … the dog legged 6th and 10th – With the 13th being the toughest par 4 around these parts.